The Chamois Time MTB race set for this Wednesday, July 29, is officially cancelled. We are hoping to reschedule to a later date, so stay tuned for updates on that. 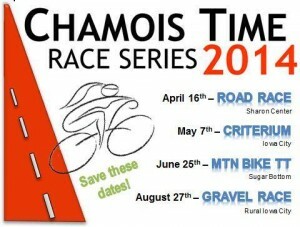 Chamois Time MTB TT Rescheduled to July 29th! 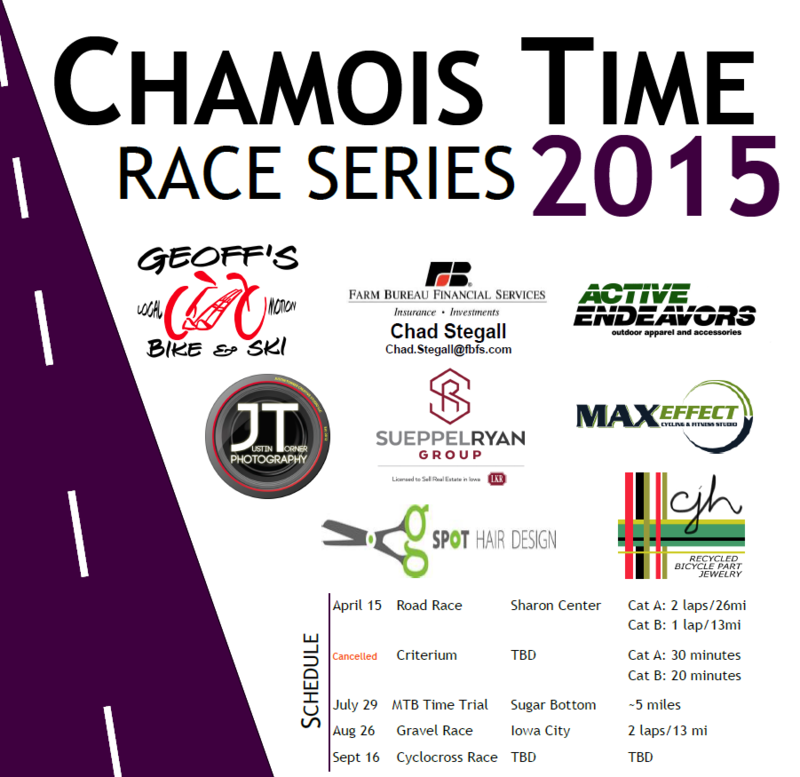 The Chamois Time Mountain Bike TT has been rescheduled to July 29th. Hope the trails are dried out by then and hope to see lots of people there! The Chamois Time MTB race set for this Wednesday, June 24th, is officially cancelled. The trails are just too wet. We are working on a rain date, so stay posted for that. Hopefully in early July. Chamois Time #1 Results are up. Thank you to everyone who came out last night to race, volunteer, or spectate! Thank you to our excellent official, Brian, and to all our awesome sponsors! Results and series standings are posted. The next race in the series will be a criterium, held in Iowa City on May 7th. Photo credit to Mark Beatty. 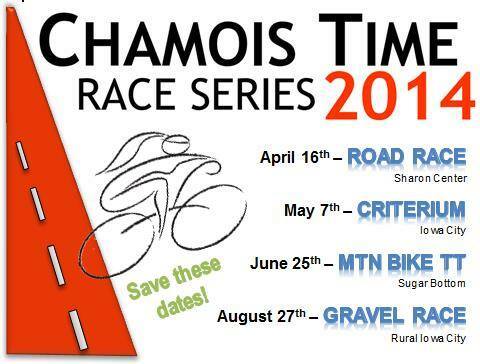 First Chamois Time Race of 2014 Series is today! 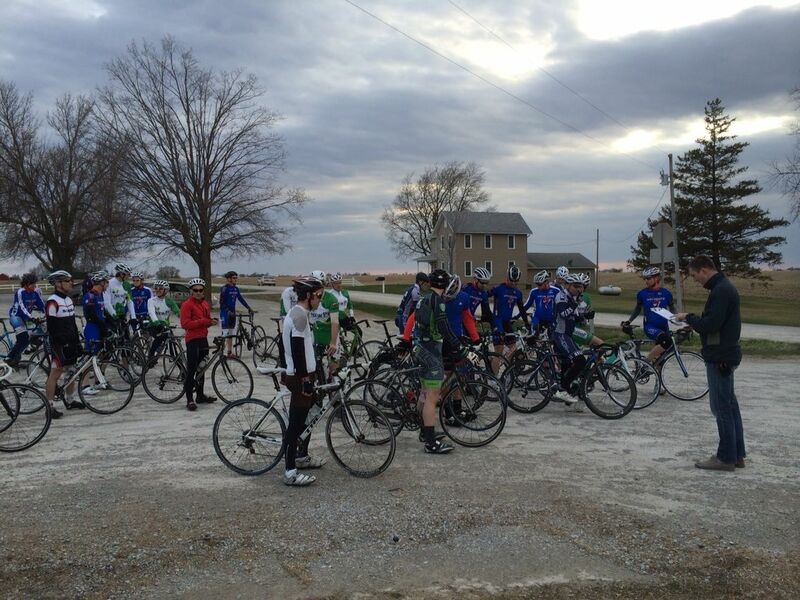 The first race of the 2014 Chamois Time Series is today, April 16th, in Sharon Center. It is the same course as the Iowa City Road Race, to be held on April 26th. Great practice race for that big one. We hope to see you at this super fun event. Gorgeous course in Amish country. Registration opens at 5:30pm, racing begins at 6:30pm. Check out some photos from the 2012 Chamois Time race by our sponsor Justin Torner Photography. These awesome photos are also available for purchase through his web site and he will be there taking photos tonight as well!